Many thanks to Marie Hughes (of Widnes) who sent in the photograph below. It’s a wonderful photo of a serviette from 1936. 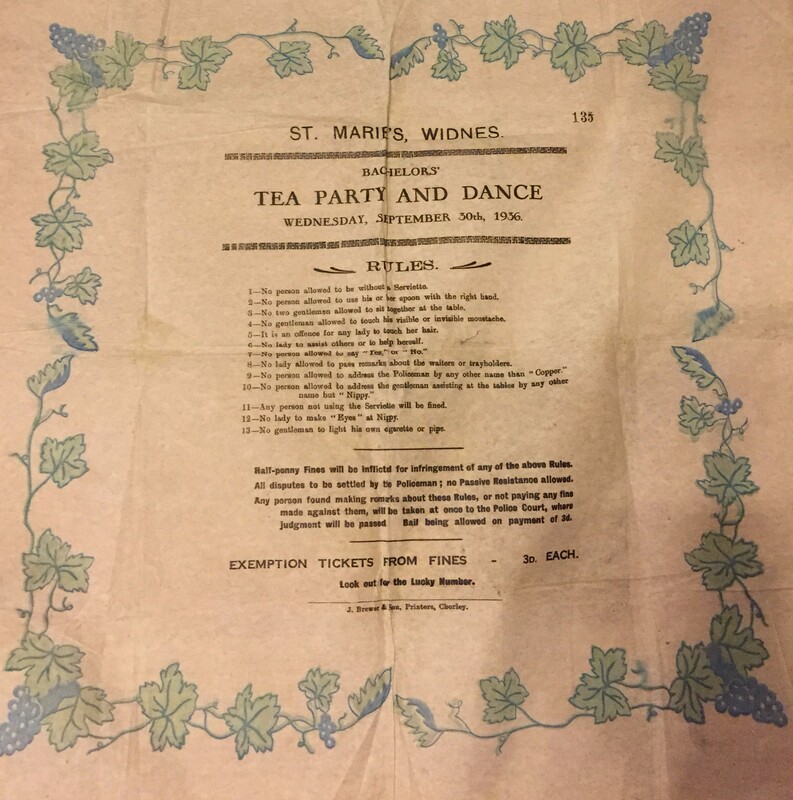 Beautifully printed onto the serviette (which I’d imagine doubled up as a ticket) are a list of rules and punishments for the Bachelors’ Tea Party & Dance at St Marie’s. I think these rules convey a tremendous sense of joy and mischief and I’d wager that the events were tremendous fun. 1 – No person to be allowed without a Serviette. 2 – No person allowed to use his or her spoon with the right hand. 3 – No two gentlemen allowed to sit together at the table. 4 – No gentleman allowed to touch his visible or invisible moustache. 5 – It is offense for any lady to touch her hair. 6 – No lady to assist others or to help herself. 8 – No lady allowed to pass remarks about the waiters or trayholders. 11 – Any person not using the Serviette will be fined. 12 – No lady to make “Eyes” at Nippy. 13 – No gentleman to light his own cigarette or pipe. Half-penny Fines will be inflicted for infringement of any of the above rules. All disputes to be settled by the Policeman; no “Passive Resistance” allowed. Any person found making remarks about these rules, or not paying any fine made against them, will be taken at once to the Police Court, where judgement will be passed. Bail being allowed on payment of 3d. EXEMPTION TICKETS FROM FINES – 3D. EACH. It’s not too late to book your place at tomorrow’s Tea Party & Dance at St Marie’s. Simply call me on (01928) 592 405. There will be live music, drinks and homemade cake. No fines in operation.